← NFL Pick ‘Em Season 5 Divisional Round – Any More Upsets? 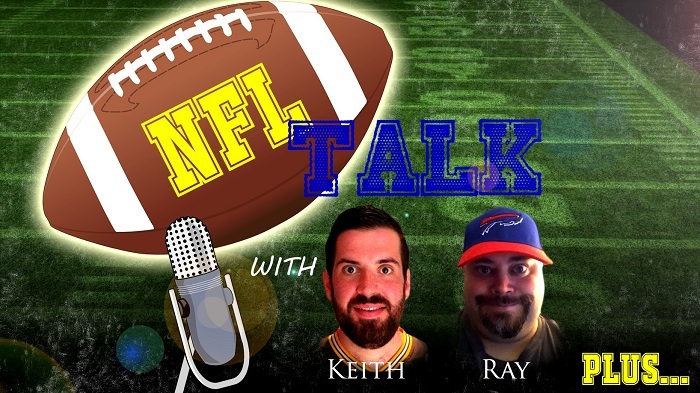 Ehnother Podcast Proudly Presents: NFL Talk Plus Episode 53! We’re back this week discussing the Wild Card round, some coaching firings, hirings and even a couple of GM replacements. We also preview the Divisonal round of the playoffs. All recorded just before the kickoff of the Divisional Rounds first game. So you can listen at halftime OR during the boring Titans vs Patriots game. There was some kind of recording issue this week, so when Keith speaks, you may hear a bit of an echo. I did try to correct this, but hopefully it won’t be too bad or disracting. This entry was posted in NFL Talk Plus and tagged Atlanta Falcons, Bill O'Brien, Brian Gaine, Brian Gutekunst, Buffalo Bills, Carolina Panthers, Chicago Bears, Darrell Bevell, Divisional Round, Football, Green Bay Packers, Houston Texans, Jacksonville Jaguars, Joe Philbin, Jon Gruden, Keith, Ken Dorsey, Kris Richard, Los Angeles Charagers, Matt Nagy, Mike Gillislee, Mike Pettine, Mike Shula, Minnesota Vikings, New England Patriots, New Orleans Saints, NFL, NFL Talk, Norv Turner, Oakland Raiders, Philadelphia Eagles, Pink, Pittsburgh Steelers, Ray, Rex Burkhead, Rick Dennison, Roberto Aguayo, Seattle Seahawks, sports, statistics, Super Bowl LII, Ted Thompson, Tennessee Titans, Tom Cable, Warlock Hour, Wildcard Round. Bookmark the permalink.